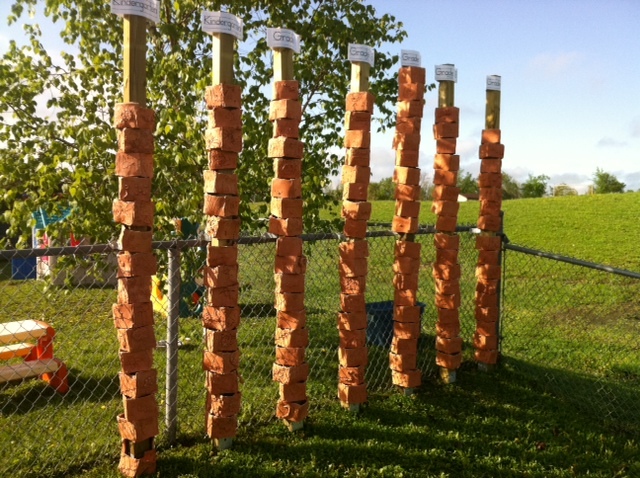 There is a new art installation at Rideau Vista Public School, actually there are 7. Guided by local artist Diane Black, the seven totem poles are the collective creativity of all 116 students at Rideau Vista. Black spent the last week of May working directly with each selected class, from kindergarten all the way to the grade five students. Explaining the importance of the totem pole in Canadian history, the student were then invited to think about what symbols would best represent them on a totem pole. 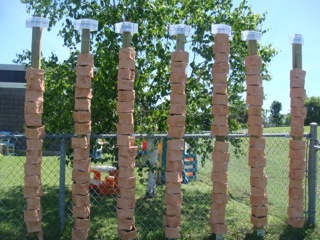 Each student was then given four slabs of wet clay to carve out their chosen totems. Many students chosen family, sports, and nature symbols. When all four pieces of clay were designed, Black helped the students assemble the individual pieces together to form a box shape with no top or bottom. Black collected all the carved clay boxes and took them home with her to dry. After firing all 116 pieces in her kiln, Black returned to Rideau Vista to slide each piece on seven 4×4 wooden posts, one post for each class. Just before the end of the year, Black will return to the school and disassemble the clay totem poles so each student can take their piece home with them.